Our event “Art from the Heart” has been cancelled and will be rescheduled. Instead, a visitor’s day, or a sponsor’s day may replace. Details to follow. If you have a ticket (tickets are free, through eventbrite, see below) to this event, you are welcome to come visit the Sanctuary’s animals between 5.30 and 6.30 pm. An additional information session will be scheduled in the near future. Comedy Fundraiser with Silent Auction. Door Prizes. Thursday, March 14. Doors open 7.30 pm, 8.30 start. Tickets $16 (sold in advance only). Contact Sue: 613-513-9480. Bring your family to visit the sanctuary and meet the residents of Penny Lane! You're welcome to bring snowshoes, cross-country skis, and sleds and enjoy the peaceful trails in our forest! We'll have delicious tea from Davids Tea and hot chocolate to warm you up by a campfire as well as some baked goods! 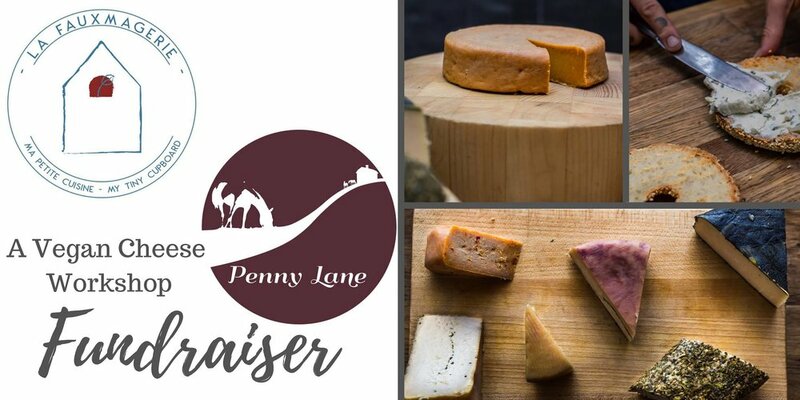 Come join My Tiny Cupboard's own Helen Rudnicki for an afternoon of vegan cheese making to help raise funds for Penny Lane Farm Sanctuary! Penny Lane Farm Sanctuary is a not-for-profit sanctuary for at risk equines and farm animals located east of Ottawa, giving new life for over 60 animals, saving many from terrible living conditions or death. 80% of ticket sales will go towards helping Penny Lane continue to care for these beautiful souls, and those to come. We have up to 20 spots available, so tell a friend and let's make this an amazing, cheese-y event! !